Fulbright Applications Now Open…Apply to See the World! Do you want to see the world after graduation? Learn a new language? Live someplace complete different from Buffalo? Conduct research in an international setting? Do something different before law/medical/graduate school? Consider applying for a Fulbright award to study, research, or teach English abroad after you graduate. Next year, six UB students will be embarking on the adventure of a lifetime to teach/research in Mongolia, Malaysia, India, Germany, Turkey, and Senegal. This could be you in 2020-21 in any of over 130 countries around the world. The application cycle for funding academic year 20-21 has just opened and applications will be due internally by the first day of the fall semester. Now is the time to come talk to me, Pat McDevitt (mcdevitt@buffalo.edu), or Megan Stewart (mrp6@buffalo.edu) in the Fellowship Office about applying. Juniors and seniors are encouraged to apply. Freshmen and sophomores are encouraged to come talk to us about planning for the future. If you’re in the Honors College, you are probably a very strong and competitive candidate. Why not apply? The program meets over the course of eight weeks for lunch or dinner; it introduces students to opportunities at the undergraduate and graduate levels. Throughout the program, participants meet students who have previously applied for and won prestigious awards. It is designed to give students the opportunity to assess their strengths, envision their futures and create plans to become competitive for major fellowships and scholarships. Students will complete Clifton StrengthsFinder and begin to write a personal statement. Freshman and sophomores are eligible to apply. The Mount Vernon Leadership Fellows Program is a highly selective summer institute for rising college juniors, offering unparalleled learning and networking opportunities at the home of America’s first president outside our nation’s capital. Students spend six weeks living and learning at George Washington’s Mount Vernon. Transportation, meals and a $3,000 stipend are provided. The Mickey Leland Energy Fellowship (MLEF) Program provides college students with an opportunity to gain and develop research skills with the Department of Energy’s Office of Fossil Energy for 10 weeks over the summer. For 20 years, this program has increased awareness of DOE research opportunities to students pursuing STEM degrees (short for science, technology, engineering and math). The goal of the program is to improve opportunities for women and minority students in these fields; however, all eligible candidates are encouraged to apply. For questions, please email us at MLEF@hq.doe.gov. Accepting Applications for the Western NY Prosperity Fellowship Program-Open to All Undergrad Majors! A leadership development program that provides selected Fellows professional development opportunities, as well as resources and access to WNY business leaders. WNY Prosperity Fellows are awarded a paid summer internship; scholarship support awarded during the academic year up to $25,000 based on a student’s unmet financial need, and an enrichment fund of $1,000. This fellowship program will assist undergraduate and graduate students who are actively preparing for careers that further economic development and growth, especially in the WNY region. Open to all undergraduate majors and select graduate programs including students in the School of Management, School of Engineering and Applied Sciences, School of Architecture and Planning, and School of Pharmacy and Pharmaceutical Sciences. complete the 2019-2020 Free Application for Federal Student Aid (FAFSA) by the advised deadline. Please note that you may file a FAFSA using estimated income information and update your FAFSA once you complete your current tax return. Are you seeking funding for your graduate education? This session will provide tools and guidance to help you identify fellowships and scholarships to support your PhD, as well as research and dissertation funding. Open to all students. • Wednesday, Sept. 19, at 3 p.m.
• Tuesday, Oct. 23, at 3 p.m.
About 80 percent of employers actively seek students who have studied abroad. 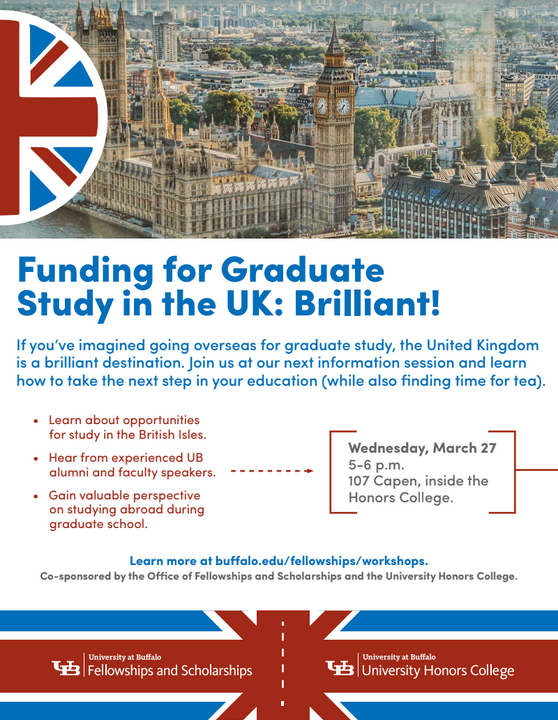 Learn about possibilities for funding international travel as an undergraduate or graduate student. Fellowships and scholarships covered in these workshops are only open to U.S.citizens. Not intended for international students. • Wednesday, Sept. 12, at 2 p.m.
• Tuesday, Oct. 2, at 3 p.m. Breaking the Code: Finding Research and Funding for STEM Students For students in STEM, participating in research can lead to funding. Learn about conducting research on and off campus as well as prestigious opportunities such as the Goldwater Scholarship and National Science Foundation Graduate Research Fellowship. Fellowships and scholarships covered in these workshops are only open to U.S. citizens. Not intended for international students. • Thursday, Sept. 6, at 11 a.m.
• Wednesday, Sept. 26, at 3 p.m.
• Tuesday, Oct. 16, at 3 p.m.